Last weekend, my fiancé and I attended Mozart’s opera Don Giovanni. Before we went, I looked up the story. 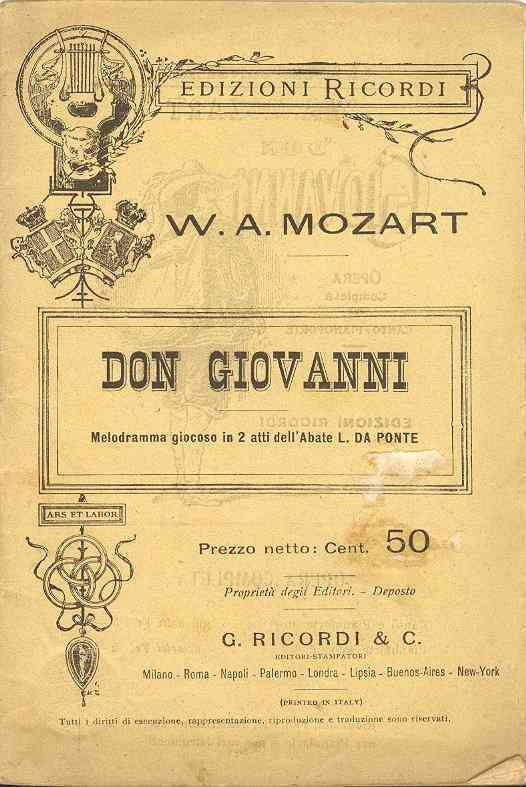 Since Don Giovanni is sung in Italian, a friend recommended knowing the story before seeing it. After reading the story, I was a bit dubious—multiple seduction scenes?—but I already had tickets. The opera was really good—my fiance and I both thoroughly enjoyed it. He had fun trying to learn Italian, using the repetitions, translations, and cognates with French. English subtitles were provided, so we were able to follow along with the words and story. I loved the music, composed by Wolfgang Amadeus Mozart and played by a full orchestra. The costumes and scenes were well done, with smooth transitions to keep the opera moving along. Don Giovanni is the story of a womanizer who goes around seducing women. His valet has a book listing all the women he’s seduced all over Europe. At the time of the opera, he’s up to about 1,800 women. However, his actions are starting to catch up with him. Donna Elvira, who both hates and loves him, wants revenge for his betrayal. She arrives in time to prevent Zerlina from succumbing to Don Giovanni’s charms. Zerlina and her husband Masetto then join Donna Elvira in trying to stop him. Donna Anna and her fiancé Don Ottavio also want vengeance, as Don Giovanni raped her and murdered her father. The five of them come after him, warning him to repent, but he laughs them off. Then Donna Anna’s father’s ghost appears and drags Don Giovanni down to hell. The opera reminded me of morality plays I studied during my English degree. Don Giovanni is shown in all his evil—and that evil catches up with him in the end. Nothing in the opera implied that he was a good model to follow; in fact, everything pointed to how wrong his actions were. Donna Anna shows how his immoral actions lead to further crimes—including murder—and how that hurt all involved. Zerlina and Masetto show how adultery almost destroyed their relationship. Donna Elvira shows how a woman hurts from a man’s betrayal. The frequent appearances of these five in the play puts more emphasis upon them, and the wrong of Don Giovanni’s actions, than upon him. Even Don Giovanni’s valet wants nothing to do with him by the end of the play, when almost everyone is ready to say “good riddance!” to Don Giovanni. Don Giovanni is an opera in two acts which premiered in Prague in 1787. It’s very different than Mozart’s Magic Flute (a kid-friendly opera!) and is an unusually intense work for this composer. Encyclopedia Britannica notes that “unlike any other composer in musical history, [Mozart] wrote in all the musical genres of his day and excelled in every one. His taste, his command of form, and his range of expression have made him seem the most universal of all composers; yet, it may also be said that his music was written to accommodate the specific tastes of particular audiences.” This is likely part of why his operas, including Don Giovanni, continue to be popular with theatre-goers of today. If you get a chance to see Don Giovanni, I recommend it.